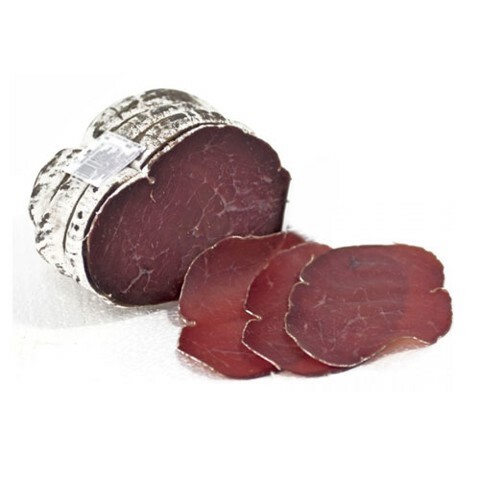 Dried Salted Meat (Italian: Coppa Stagionata) is a product made from meat of a kind of local pigs that live wildly in chesnut jungles. Normally their thighs with less fat, thin skin will be chosen to make this dish. The meat, after being chosen, will be seasoned with natural sea salt (no harmful chemicals) and be tighted by a kind of jungle leaf and rope outside. The package then will be hang on a high place to dry naturally. The complete product will have a nice orange-pink color, usually being cut into very thin slices, when eating we will feel the nice specific smell and feel like each fibre of meat is melting fast in the mouth.